STATESBORO, GA - CURRY, Mr. Donnell Curry "Donnie" was born into this world on October 22, 1957 to the loving parentage of the late Carl and Laura Curry in Cincinnati Ohio. At an early age he accepted Christ as his Lord and personal Savior. Donnie was a grdaute from Aiken High School of Hamilton County and worked as a Construction Mason for many years until he was physically unable to work. On Wednesday January 22, 2014, in his 56 season of life at East Georgia Regional Medical Center, God dispatch his guardian angel to usher Donnie into his heavenly home, receiving his blessing of immortality. He was preceded in transistion by his parents and two sister, Eva Thomas and Ann Rice. Donnie had an unmatchable sense of humor and developed a knack of making other laugh and lightening the load with joy. He was a simple man and was happy and content with what he had and never worried with what he didn't with what he didn't. He was good to others, the kind of good that is remembered. He enjoyed fishing and good tiems with his family and friends. As time went on, Donnie grew tired and weary. God saw him hurting and weal, but he also saw the love and kindnesss, in his heart. God called Donnie home not to make those he left behind feel sad, but to allow them to celebrate his life and his home going knowing that to be absent from thtis body is to be present with the Lord. Donnie's soul is gone from his body but his memory will live on in all who knew and loved. He leaves to forever cherish his memory by his children; Chinesa Wooten of Cincinnati, Oh., La Donn Hoke, Tiera Hoke and Stephanie Hoke all of Waverly, Ga.,; five grandchildren, Isaiah Hoke, Elijah Hoke, Stella Hoke, Dylan Hoke and Kayden Brown all of Waverly, Ga.; two sisters, Diane (Gregory) Smith and Sheila (Albert) Marshall both of Statesboro, Ga.; three brothers, Carl Curry, Jr. of Statesboro, Ga., Cecil Curry of Cincinnati Oh., Clamas (Cathy) Curry of Cincinnati, Oh. ; and Darryl (Bonita) Curry of Statesboro, Ga.; Special friends, Gregory Walden and Fred Simmons both of Cincinnati, Oh., Pastor Craig McDaniel of Hillsboro, Oh., Buford Williams of Jacksonville, Fla.and Cedric Ruff of Cincinnati, Oh. ; and a host of neices, newphews other relatives and friends. 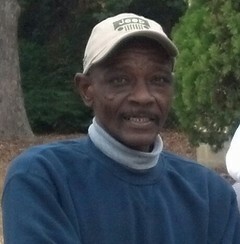 Public Visitaiton for Mr. Donnell Curry will be held on Friday Feburary 7th, 2014 from 12:00 noon until 8:00 PM at the funeral home. Celebration of Life Service will be held on Saturday February 8th, 2014, 11:00 A.M. in the Charlie L. Walker-Roberson Memorial Chapel. Bishop Larry Jones will officiate. Burial will follow in the Eastside Cemetery. Professional Service of Comfort Entrusted to Roberson Funeral Home, Inc.